Cary, NC, April 18, 2018 – Wipes that can help protect firefighters against cancer-causing carcinogens, a refillable tote wipe system and sustainably produced cleaning wipes made entirely from plant starches are the finalists for INDA’s 2018 World of Wipes Innovation Award®. The winner will be selected by attendees at WOW 2018, June 5-8, at the Sheraton Grand in Chicago. INDA expects 500 senior-level participants from every area of the wipes segment at this year’s event, repeating last year’s strong turnout. WOW 2018 will feature emerging technologies, new applications and market insights for engineering new business growth. Hero Wipes are specially formulated to remove toxic, cancer-causing carcinogens from firefighters’ skin after they exit a fire. These wipes are used on-site to decontaminate and clean the vulnerable skin of firefighters. A patent-pending balanced blend of ingredients isolates harmful chemical compounds and traps them in the tough and strong wipe. Third-party testing shows that Hero Wipes remove 98 percent of the toxic flame retardant TCEP and 83 percent of the carcinogen Benzopyrene, a component found in soot. Rhino Wipe Tote System features a carry handle and built-in adjustable straps to attach the water repellent container to surfaces (such as the back of a car headrest) for easy dispensing of Rhino wipes. The reusable wipes can be rinsed and reused multiple times and are binder, silicone and solvent free. The patented packaging system offers portability for on-the-go uses and convenience. Ode to Clean Wipes are the first wipes in which the substrate and the cleaning solution (Bioperoxide) are made entirely from plant starch. The young start-up company has developed an enzymatic process that is a less expensive and more efficient way to convert plant sugars into high purity hydrogen peroxide for use in various industries starting with these green cleaning wipes. 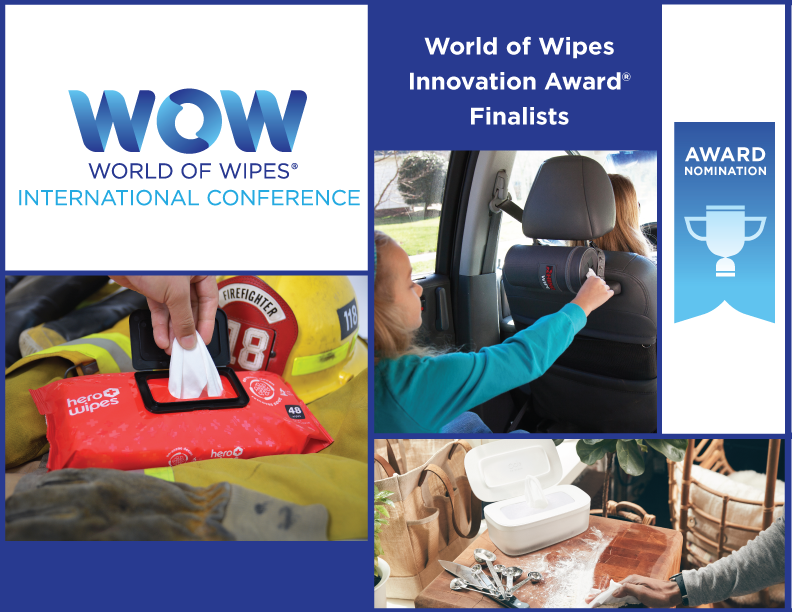 The World of Wipes Innovation Award recognizes the winning product that both expands the use of nonwovens and demonstrates creativity, novelty, uniqueness and technical sophistication. Nominated products represent the entire nonwoven wipes value chain. Past winners have included the Chicopee’s Microfiber Floor Mop System, Tec Laboratories’ Tecnu Bites & Stings Medicated Itch and Pain Relief Wipes, and Clorox’s ScrubSingles Kitchen pads. WOW attendees hold an important one-third of the vote in their hands. The award finalists will make their presentations on June 6 and INDA President Dave Rousse will announce the winner on June 8. The INDA Technical Advisory Board and the WOW Conference Planning Committee have equal one-third votes to the attendees in determining the top company for the prize. The WOW conference will be headlined by presentations on the hottest topics, with exclusive insights on market data, flushability, substrates and ingredients, and sustainability presented by some of the biggest names in wipes. Kit Yarrow Ph.D., Professor Emeritus, Golden Gate University, will deliver the keynote address on Gen Z Deciphered: Insights and Strategies for Marketers. A welcome reception on the 95th floor of the John Hancock Center offering Chicago’s most stunning panoramic city view of the miracle mile, two days of tabletop exhibitions and Dinner with Industry Thought Leaders are among the valuable networking opportunities. For the full program, visit www.inda.org/events/wow18. INDA, the Association of the Nonwoven Fabrics Industry, serves hundreds of member companies in the nonwovens/engineered fabrics industry in global commerce. Since 1968, INDA events have helped members connect, learn, innovate, and develop their businesses. INDA educational courses, market data, test methods, consultancy, and issue advocacy help members succeed by providing them the information they need to better plan and execute their business strategies. For more information, visit www.inda.org, or download the INDA mobile app for immediate updates.